We’d love your help. Let us know what’s wrong with this preview of Gone West by Carola Dunn. In September 1926, Daisy Dalrymple Fletcher visits Sybil Sutherby, a school friend now secretary to a novelist supporting a house of hangers-on by thrice-yearly Westerns. Sybil took over while Humphrey Birtwhistle was ill, sales increased, and she suspects someone is poisoning him - until he suddenly dies. Daisy investigates. To ask other readers questions about Gone West, please sign up. Don't invite Daisy Dalrymple to stay at your place for the weekend, for wherever she goes an unexpected death seems to occur! And in 'Gone West' it is no different. She visits Eyrie Farm in Derbyshire at the request of a friend who is in a quandary over something she and the owner of the farm are involved in. Daisy soon finds out what the problem is and it concerns the owner, Humphrey Birtwhistle, and his occupation as an author of Western fiction. Daisy's friend, Sybil, is his secretary but she Don't invite Daisy Dalrymple to stay at your place for the weekend, for wherever she goes an unexpected death seems to occur! And in 'Gone West' it is no different. She visits Eyrie Farm in Derbyshire at the request of a friend who is in a quandary over something she and the owner of the farm are involved in. Daisy soon finds out what the problem is and it concerns the owner, Humphrey Birtwhistle, and his occupation as an author of Western fiction. Daisy's friend, Sybil, is his secretary but she has also been involved in something more than that of late. Daisy contemplates the problem, which is acerbated by the fact that Sybil thinks Humphrey has seemingly become more ill and lackadaisical for no apparent reason as the days passed. The farm is filled with family and a few friends who rely on Humphrey's income to keep them in the custom to which they expect and as Humphrey becomes less well, suspicion falls on all those around him for he has no obvious physical ailments. While Daisy is trying to work it out, Humphrey dies suddenly and this throws the whole gathering into panic and confusion. The local constabulary in the form of Detective Inspector Worrall is called in and in addition assistance from Scotland Yard is asked for and Superintendent Crane deputes Detective Chief Inspector Fletcher to go up to Derbyshire to get to the bottom of what has happened. There is method in Crane's choice for by then he is aware that Daisy, the DCI's wife is already at the scene of the crime and he is apt to be very touchy at the slightest hint that Daisy has got herself involved yet again in anything remotely criminal. Before DCI Fletcher arrives, Daisy cannot help herself and she gets involved in trying to discover exactly what has happened; with 11 possible suspects she has plenty of investigating to do. When Fletcher does arrive he is almost unbelieving, and somewhat annoyed, that his wife is once more on the scene of a crime, for by this time it has become common knowledge as to how Humphrey has died. From then on he takes charge but keeping Daisy out of the action is not easy. His instinct is always to keep her as far away from his investigations as possible but he is not very successful at it and he knows that once she is involved one way or another she will stay involved. And so she does, but it is Fletcher who eventually realises what has happened and who the perpetrator is, so the case is solved to the satisfaction of all. While the 1920s setting of the book is admirable, the plot is a little weak and its uncovering is, for me, lost in too much verbiage, so much so that by the end of the book, I was wondering why the crime has been committed and how Fletcher has realised who the killer is. This is not definitely Daisy Dalrymple at her very best. Couldn't get interested in this one. Unsympathetic characters, uninteresting plot. Skipped, skimmed, am marking this one DNF/Don't Try Again. Gave up on this 8/23/17. Sadly this book was just very meh. It took over one hundred pages (about a third of the book) till the murder happened which is just too long. I appreciate some setup but not at that lengths. Additionally I just didn't care for the characters that much. Usually Dunn is really good at introducing a set of characters from really likeable to absolute jerks (though thankfully the jerks aren't always the murderers) but here almost everybody acted horribly and annoying (with the exception of Daisy's ol Sadly this book was just very meh. It took over one hundred pages (about a third of the book) till the murder happened which is just too long. I appreciate some setup but not at that lengths. Additionally I just didn't care for the characters that much. Usually Dunn is really good at introducing a set of characters from really likeable to absolute jerks (though thankfully the jerks aren't always the murderers) but here almost everybody acted horribly and annoying (with the exception of Daisy's old school-friend Sibyll who admittedly was quite interesting): there's Simon the murder-victim's son who acts incredibly snobbish (he does get better after the murder but as we already established that this is quite late so we have to suffer through a lot of stupid comments before that), the victim's siblings (don't ask) and of course Myrna and her two admirers. Especially Myrna failed badly as character. I think she was supposed to be a subversion of the silly air-headed girl who only cares about clothes-type and at first it worked. She does regularily run out of her allowance money because she spends it on clothes and jewellery but there are also moments where she shows compassion and insight...and than ruin it again by acting incredibly stupid. Her two admirers really weren't any better so the amount of likeable characters was very limited. The mystery was actually OK...only that at the end it seemed like Dunn suddenly realized 'oh crap I only have 5 pages left to wrap it all up' and just threw everything (from the actual resolution of the crime to the resolution of all her red herrings) at the reader. Another engaging entry in this long-running series. This is the second time I've read it and I enjoyed it every bit as much this time around. #20 in the Honorable Daisy Dalrymple (and her husband Scotland Yard Detective chief Inspector Alec Fletcher), magazine writer and heiress (no inheritance due to British entailed system) mystery series. It is late September, 1926 and Daisy is visiting a school friend in Devonshire who is a confidential secretary to a novelist. She feels something is not as it shoud be and asks Daisy to discreetly invesitgate. Daisy finds a novelist in declining health with a family living on him along with a disg #20 in the Honorable Daisy Dalrymple (and her husband Scotland Yard Detective chief Inspector Alec Fletcher), magazine writer and heiress (no inheritance due to British entailed system) mystery series. It is late September, 1926 and Daisy is visiting a school friend in Devonshire who is a confidential secretary to a novelist. She feels something is not as it shoud be and asks Daisy to discreetly invesitgate. Daisy finds a novelist in declining health with a family living on him along with a disgruntled brother and sister who aren’t happy he inherited the estate even though 30 years have passed; a wastrel appearing 20 year old son, an attractive 18 year old daughter acting like she has fluff for brains with an expensive fashion life style and 2 suitors she’s stringingly along because she likes the attention. Soon there is a murder and not long after that Alec is called in. Another entertaining Daisy & Alec adventure. This one was less enthralling than previous ones simply because it seemed too long for the story it was telling. Perhaps a bit more editing would have been appropriate. Perhaps too it was the heavy atmosphere of the country estate which was the setting that dragged it down some. Still on my enjoyable books list though, & as usual I'm looking forward to the next one. An old school friend of Daisy's approaches her for help. She believes something is wrong in the house where she works. Daisy arrives with very little information to find a unique family situation and soon her friend's boss dies. Daisy and soon Alec investigate. I love this series, but this was exceptionally slow. I didn't enjoy the setting or the characters. The mystery didn't feel very mysterious and I found it exceptionally hard to finish reading this book. Despite being the 20th in a series I still generally like the Daisy Dalrymple series and this is another good addition. The only thing for me was that I noticed Daisy being a bit snobby in this book, something I can't say I picked up on in others, where she seems to have been more embracing of peoples differences of experiences. Daisy becomes involved in a murder case whilst she is staying with friends. Her husband, Chief Inspector Fletcher of New Scotland Yard, is called in to investigate, and Daisy assists. As with the rest of the series, Gone West is charming and light, with very little meat to the story, but still entertaining. I liked the characters and setting but this book could have been better edited. The story dragged on once they were figuring out who was the murderer. I will try another book in this series because Daisy seems to be a great character. A charming but disorderly mystery that may or may not include a murder. As Daisy’s cousin, Viscount Dalrymple, searches for the heir to his title, she meets and (mostly) befriends distant relatives vying to inherit the peerage. Heavy on aristocratic coziness but light on the body count. It took 13 chapters before I got "into" it! Really enjoyed this one. Again the setting was moved from the haunts of the rich and/or aristocratic. The characters were engaging and the plot satisfying. I love trying to figure out “who done it.” The author has a lot of twist and turn to keep you guessing about the culprit’s identity. I think I will be saying goodbye to this series. Daisy wasn’t close to Sybil Sutherby when they were at school together, but when Sybil tells her an intriguing story and asks for her help Daisy (of course!) can’t resist. She travels to Eeyrie Farm to visit Sybil for a couple of days, and meets a motley group of people, the Birtwhistle family, where Sybil works as the author’s personal secretary. He does appear to have a most peculiar illness - waxing and waning but never becoming quite well, and as Daisy gets to know the people and understand their various situations, she becomes aware that *something* odd is definitely occurring. Sybil was right to be worried, it seems, and when someone dies under peculiar circumstances The Yard is called in, specifically (to Daisy’s dismay) her husband Alec Fletcher. I adore Daisy and always enjoy Ms. Dunn’s stories, but while this was a solidly entertaining historical cosy, it wasn’t quite as sharp-edged as many of her earlier books: everything seemed far lighter in tone than is usual for this series, and I wasn’t quite as “involved” with the characters and plot as I usually am with Ms. Dunn’s works. While most of the characters seemed quite sketchily drawn even by the end, a couple *were* well-done, strong “presences” in the story; generally, in the earlier books almost all the characters presented as central to the plots are quite distinct and enjoyable, each in their own manner. A bit light on SOMEthing else too, but I can’t quite figure out what. There are some really nice swipes at the publishing industry of the period and several nicely tart jibes, though, at Society snobs, and that’s always fun. Plus a bit of a gentle poke at the “rural types” so favored in popular fiction of the period. Ms. Dunn always manages to weave into the Daisy stories a bit of the tone or feeling of fiction actually from the mid-1920s, and I always find that very entertaining, but you may need to have actually read several of those sorts of books to catch those nice little bits. This twentieth in the series isn’t quite “thrilling!” so not truly a thriller, not terribly mysterious for although the plotting was very good I picked up on the murderer fairly quickly; still I did not guess the culprit behind a couple of other nefarious doings, sooo... sort-of mysterious. And definitely an “historical cosy” as the pacing is rather slow at times and everyone is oh-so-teddibly-genteel, gorgeous costumes are lovingly described and local customs of both society types and The Locals are nicely included, as well as a good lot of information about local policing in rural England in the mid-1920s (but not at all in a pedantic or lecturing tone). A mild caveat: this really needed a map of the rambling old house/manorhouse - it was incredibly confusing in spots trying to follow just where the protagonists were in relation to others, and their various rambles/destinations were often central to the plot. And, most unusually for me, I had a difficult time “seeing” the characters at first - it took quite a while for me to be able to differentiate among the various “voices”. This doesn’t usually happen in a Dunn novel! Daisy's back! More, in Gone West (1), she's gone to visit rambling English houses again and having to deal with an eccentric family, untangling their motivations and helping them sort out their personal lives while she's at it. After Anthem For a Doomed Youth I was worried. Not that Anthem for a Doomed Youth , was a bad book, but it was much more Alec's book than Daisy's, and more police procedural than cozy, and Daisy and her visits to old English houses are what hooked me on this series. In Gone Daisy's back! More, in Gone West (1), she's gone to visit rambling English houses again and having to deal with an eccentric family, untangling their motivations and helping them sort out their personal lives while she's at it. In Gone West , Daisy is asked by an old school friend to come out to the farm where she works to investigate what she fears may be the slow poisoning of her employer. Of course, almost as soon as Daisy arrives and concludes it's all nonsense, someone really does poison the man, and it's up to Daisy to find out who. All the things I liked about the Daisy Dalrymple series are back: The rambling English house in the countryside, Daisy's cheerful friendliness, her insatiable curiosity, and her ability to talk to almost anyone about anything. Most of the entourage she has picked up in the last few books are gone. I like the entourage, but it was growing to alarming proportions, and it's good to see that Dunn can leave some of them behind from time to time to focus on the smaller team. For all of my rejoicing, I have to admit that the ending was a bit of a letdown. Generally, although these are not dark books, there is more tension involved in the solution to the murder, and there's a more direct line from Daisy's reasoning to the solution. Here, we did see the clues, but... I'm not entirely convinced. Even so, with these books, the journey is most of the fun. The secondary mystery, on the other hand, is quite satisfactorily resolved. Still, it was good to see Daisy again, and I'm very much looking forward to The Valley of the Shadow , Dunn's next book in her new(ish) Cornish Mysteries series, which is coming out in December. (1) Which has the same title in the US as in the UK, though there is a short explanation for American readers. Thank you Minotaur Books! Review originally published at The Bookwyrm's Hoard. Once again, Daisy is on the scene when a murder occurs… and once again, Superintendent Crane of Scotland Yard sends Daisy’s husband, Chief Inspector Alec Fletcher, to catch the killer – and not incidentally, to keep Daisy out of trouble. If you can suspend disbelief long enough to accept the appalling frequency with which Daisy finds herself involved in murder (an inevitable problem for any cozy mystery series, and one which Dunn addresses at l Review originally published at The Bookwyrm's Hoard. Once again, Daisy is on the scene when a murder occurs… and once again, Superintendent Crane of Scotland Yard sends Daisy’s husband, Chief Inspector Alec Fletcher, to catch the killer – and not incidentally, to keep Daisy out of trouble. If you can suspend disbelief long enough to accept the appalling frequency with which Daisy finds herself involved in murder (an inevitable problem for any cozy mystery series, and one which Dunn addresses at least in part though Daisy’s marriage), then you will find Gone West an enjoyable if not inspired addition to this pleasing series. Dunn populates the story with a nice mix of likable and annoying or unpleasant characters. There are several possible motives for Hubert Birtwhistle’s death, each just unusual enough to be refreshing (if one can refer to murder in such a way.) Alec’s investigation is complicated by the suspicion that Hubert has been being drugged or poisoned over several years. Several people had an interest in keeping Hubert ill, but would they have wanted him dead? Dunn has crafted her puzzle well. There were few suspects I could definitively rule out, and while I did consider the person eventually identified as the murderer, I wasn’t convinced until shortly before the solution was revealed. The location, a remote remodeled farmhouse, adds to the traditional British cozy feel, as does the 1920s time period. If you’re new to the Daisy Dalrymple series, I suggest starting at the beginning to get the recurring characters’ back story. The first book isn’t among my favorites, but the early books in the series develop the relationship between Alec and Daisy. You can, of course, begin with this book, but it’s easier to understand why Alec allows Daisy to be involved with his investigation when you know their history. If you’re already a fan, then by all means pick up this volume, curl up with a cup of tea, and enjoy! FCC disclosure: I borrowed this from the public library. If you like Agatha Christie you'll like Carola Dunn, who writes with the dame's ease. This mystery has a classic feel to it that invites a reader to light a fire in the study and retreat to that easy chair next to it, cup of tea in hand and the little Jack Russell terrier at your feet. The story is a "who done it" puzzle as easy to enjoy as a drift down one of England's canals. Writer Dunn is an expat Brit living in Eugene, Oregon. If you're English and land in the United States, it's hard to im If you like Agatha Christie you'll like Carola Dunn, who writes with the dame's ease. This mystery has a classic feel to it that invites a reader to light a fire in the study and retreat to that easy chair next to it, cup of tea in hand and the little Jack Russell terrier at your feet. The story is a "who done it" puzzle as easy to enjoy as a drift down one of England's canals. Writer Dunn is an expat Brit living in Eugene, Oregon. If you're English and land in the United States, it's hard to imagine a more copacetic place than Eugene -- maybe Corvallis, up the road, or Ashland, just south with its Shakespeare Festival, or even Portland... but all of them share a green rolling landscape and cultural sensibility that must have helped Dunn settle in. Even so, her nostalgia for England, rural Dorset in this case, had me wanting to book tickets. 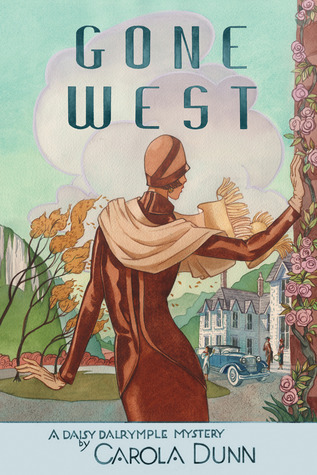 Gone West, set in the 1920s, has the requisite yet-to-be-electrified manse; country folk both dour and genial; a clever detective, Daisy Fletcher, a writer whose husband works for Scotland Yard -- a real detective, who is in turns appreciative of Daisy's help and exasperated by her meddling. Daisy has driven from London out to the wilds of southwest England at the request of an old school acquaintance, a widow Daisy doesn't know well. The woman is secretary to a sickly author of Western pulp fiction -- he puts out three books a year, books that have become much better sellers since his long and worsening illness necessitated Daisy's old friend taking on the writing. Is someone in the household dosing him, keeping him sick so the secretary can keep up the writing? The writer dies a bit more than halfway through the book, and now it's up to Daisy to make certain the killer doesn't go free. Fun as usual. They may be a bit formulaic, but on the other hand you know that you are going to get a nice cosy mystery, so if that is what you want, that's just fine. Several years ago, I read nine or ten of the Daisy Dalrymple mysteries and enjoyed them all. Then, I wandered away from Daisy and rather forgot about her. I was excited to win a copy of "Gone West" through the Goodreads first-reads program, and enjoyed running into many familiar characters once again. As always, I like the fact that Daisy is an independent thinker during a period of time when it was mortifying to find a woman of a certain class holding a job. Since Daisy's father died of illness a Several years ago, I read nine or ten of the Daisy Dalrymple mysteries and enjoyed them all. Then, I wandered away from Daisy and rather forgot about her. As always, I like the fact that Daisy is an independent thinker during a period of time when it was mortifying to find a woman of a certain class holding a job. Since Daisy's father died of illness and her fiancee was killed in the war, she fell into a career as a writer. Due to her breeding and background, she was able to go into some of the finer estates and write articles about the grand homes. Of course, murders always seemed to happen wherever Daisy went. This is also how she met Scotland Yard detective Alec Fletcher. In this outing, Daisy and Alec have been married for some time, Alec's daughter is 13, and Daisy has given birth to Miranda and Oliver, twins, who are toddlers. An old school friend invites Daisy to come to Derbyshire to discreetly investigate a feeling that something is seriously amiss. The friend is a confidential secretary to a novelist. Yes, there is a murder, but by the time I finished the book, I felt that the motive was extremely weak and was rather disappointed. In this book, #20 of the Daisy Dalrymple mystery series, one of the characters complains about an author using too predictable a formula for their books. It made me think that this book, itself, has become a little formulaic. Daisy becomes a house guest of yet another friend and has to solve yet another murder. Sometimes, the plots, characters, and the settings make up for the repetitive framework, but this estate isn't described much, two of the suspects are so taciturn that there's hardly any In this book, #20 of the Daisy Dalrymple mystery series, one of the characters complains about an author using too predictable a formula for their books. It made me think that this book, itself, has become a little formulaic. Daisy becomes a house guest of yet another friend and has to solve yet another murder. Sometimes, the plots, characters, and the settings make up for the repetitive framework, but this estate isn't described much, two of the suspects are so taciturn that there's hardly any conversation or characterization of them, and there are not a lot of plot twists. Even Ernie Piper no longer looked at Daisy as infallible. I suppose part of the lackluster setting is because Daisy is no longer writing her articles about the follies. That made for an interesting setting in "Sheer Folly," and the Tower of London made an interesting setting in "The Bloody Tower." I still do enjoy the friendships in this book, and I did not guess the murderer. "The young tend to see people close to them as immortal." "Independence does rather lose its lustre when one loses one's job." This mystery has always struck me as rather gloomy. Possibly it is the setting - a rather remote hilltop farm, above a spa town, many of the main characters don't like each other, it's all lit by oil lamps.... gloomy. Daisy is visiting at the request of a school friend, Sylvia, who now works as a secretary to man who writes Westerns. He got sick with pneumonia a year or so ago & isn't recovering. He's always tired. Sylvia wonders if maybe someone is causing it & wants Daisy to come & This mystery has always struck me as rather gloomy. Possibly it is the setting - a rather remote hilltop farm, above a spa town, many of the main characters don't like each other, it's all lit by oil lamps.... gloomy. Daisy is visiting at the request of a school friend, Sylvia, who now works as a secretary to man who writes Westerns. He got sick with pneumonia a year or so ago & isn't recovering. He's always tired. Sylvia wonders if maybe someone is causing it & wants Daisy to come & see what she thinks. Keeping him tired means Sylvia keeps writing the books, something she gradually took over during his illness. She's a better writer than he is and the books sell much better now. If he recovered he might start writing again, instead of just coming up with the plots & less money will be coming in. Daisy arrives & meets the author, his wife, his sister, his brother, his son and a female cousin, plus a friend of the son's and a suitor of the cousin's. Okay. That's that. After twenty installments I've officially had it with Alec Fletcher, Tom Tring and Ernie "the pencil man" Piper. A hundred pages passes before someone gets killed - and is that a bad thing? No, it isn't. In the company of Daisy, in a remote and atmospheric place, together with a cozy group of suspects to be, you're perfectly pleased and entertained. But when a dead body finally turns up and the murder investigation starts (and the story ought to be firing up) the smile on your Okay. That's that. After twenty installments I've officially had it with Alec Fletcher, Tom Tring and Ernie "the pencil man" Piper. A hundred pages passes before someone gets killed - and is that a bad thing? No, it isn't. In the company of Daisy, in a remote and atmospheric place, together with a cozy group of suspects to be, you're perfectly pleased and entertained. But when a dead body finally turns up and the murder investigation starts (and the story ought to be firing up) the smile on your face soon fades.